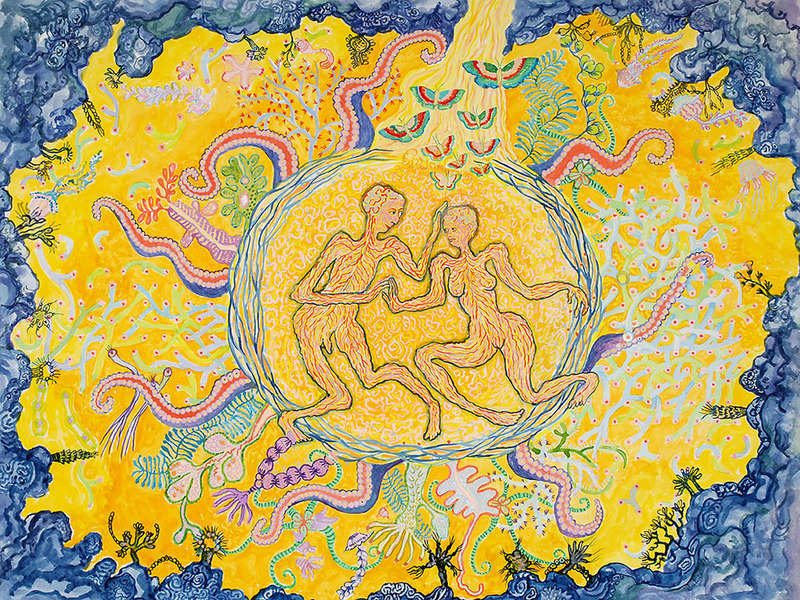 At first glance, this painting is a mandala structured around two people inside a center circle that radiates the 8 arms of an octopus. The mandala is framed by a ring of blue anemones and other marine invertebrates. It's what you'd see if you were underwater in a pond rimmed by rocks and the small invertebrates that grow on them; you are looking up at the golden yellow sky watching a floating wreath of living creatures. Look closely at the areas to the right and left of the wreath, filled with intertwining pale green and turquoise tubing. This network of tubules is just one interpretation of what an hexagonal array of circles could represent to someone studying thin sections of a cell, as you can see in the black and white drawing (Fig. 8.1 from The Molecular Biology of Plants, from the University of California Press E-books collection). How do scientists know which interpretation is valid? By looking at membrane structures from many different angles, with many different tools. Do we know that our experiences of life are only the tips of many icebergs? To know what the vast universe is REALLY like we must go beyond our own personally and culturally biased ways of interpreting what we see. We must keep expanding our sources of information and build the picture in our mind that we cannot necessarily see with only our own eyes.